Neptune is one of those planets that I’d love to sit down and have a cocktail with; now that he’s coming home into Pisces I may get my chance! He’s got so many different sides to him that a little intoxication could make the conversation fun. Not to mention, Neptune is the ruler of all things intoxicating so sharing a little holiday spirit with him makes sense. Intoxication comes in many forms—one of them can be the wonderful and wicked spell of love. Neptune likely wouldn’t tell me all his secrets, but perhaps I’d be able to get a few tidbits to better explain his power in the romance department. If you’ve ever been “head over heels” or wrapped up in that dreamy spell state over someone, you’ve likely been hit by Neptune. Many of us are looking for a little more romance and excitement in our lives—and Neptune brings just that. When Neptune comes around, he brings with him all those things that many of us daydream and fantasize about. However, he’s got a bit of a naughty side as well, so you need to be careful not to be taken in by his power. Just as easily as Neptune can weave his spell of love around you, he can take it away and burst your love bubble. The problem is that he doesn’t just swoop in and take it away quickly. Unfortunately, he likes to take his time and dissolve things in a slow and painfully gut-wrenching way. He’s also got a way of making us get wrapped up in the clouds where we can’t see things as clearly as we should. Ever get involved in a relationship that clearly was wrong … but ever so much fun? Ever in a mode where you were looking at things through “rose-colored glasses,” trying to convince those around you that what you were doing was beneficial only to later find out it wasn’t? Neptune was likely behind all of it. It’s likely that he appeared to set off some things in your chart. [ad]But Neptune does have a good side and he’s about to show it! He’s just about to come back home into the sign of Pisces. In Astrology the energy of a planet works better in some signs than others. In Neptune’s case, Pisces is his natural domain—the place where he operates best, since Neptune is Pisces’ ruler. Every sign has at least one ruling planet. When a planet is in their “home base,” so to speak, they tend to behave well and bestow wonderful things. There will be no denying Neptune’s power upon his return back to the place he loves best. My Dad, who has been an Astrologer for longer than I’ve been alive (33+ years) as well as my mentor in the field, would tell me stories of how beautiful it would be when Neptune finally comes home. My eyes would light up and I couldn’t wait for this momentous time to finally happen. The most wonderful stories of all time have unfolded because of our dreamy and romantic friend. However not everyone gets to experience this side of Neptune, since he moves ever so slowly staying in a sign for around 14 years or so! It takes him around 168 years to travel through all the signs. It’s neat to see in your own chart where Pisces resides and how the entrance of Neptune into this sector will affect that particular part of your life. If Neptune makes a beneficial aspect in your chart, your dreams of finding your Prince Charming can become a reality. The water signs (Pisces, Scorpio and Cancer) should especially reap the rewards of his good side. Some signs will have to contend with Neptune’s more un-alluring features over the course of his ride through Pisces. Planets in Sagittarius, Gemini and Virgo will likely feel the side of him that can cause some challenge. While Mr. Loverboy does have many endearing qualities, we need to be mindful of his darker side. Have you ever been wrapped up in a time of confusion or disillusionment? Neptune may have been at the root of that problem. Because Neptune is slow, he can cause grief for extended periods, for example dissolving relationships over long periods of time rather than with a quick break. When Neptune appears, it is also possible to use that time to learn more about yourself and your life. Even if you are not directly affected by Neptune, his energy upon mankind in this sign will likely be felt by many of us. Neptune’s energy can sometimes drive us to help people in need and aid in the fight for a cause. We may dive more into philanthropic endeavors and be driven to help others. People are always looking for a little fun, more romance, their Prince Charming. Through Neptune, you may end up finding what you are looking for—however be careful not to get caught up in the moment. With all the harsh realities of life, I don’t see the harm in putting our heads in the clouds for a bit with a little help from Neptune. Just be aware that the clouds will dissipate after a while and you’ll come back down to seeing things in their real light. Have you experienced the naughty or nice side of Neptune? Tell us about it in comments below. Neptune games — Will the real person please stand up? “Modern Astrological Insight With a Twist” is what Crystal B. is all about. She has been around Astrology all her life learning the trade from her father. 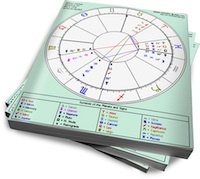 Her goal is to give the public a fun & special twist on all the benefits of what Astrology can offer – from a predictive as well as counseling standpoint. You can read more about her and her offerings at www.crystalbastrology.com or check out her blog at www.crystalbastrology.wordpress.com. Thanks for your comments! It is neat to look back and see Neptune’s effect on our lives – that is for sure. How nice that your father is an astrologer and your mentor! You interpret that water signs will benefit. Does Neptune highlight all planets in water in one’s chart beyond the sun sign? What if you are a water sign with your natal Neptune in Sagittarius? Thanks NovLady! I’ve definately been around Astrology all my life and I thank my Dad for it 🙂 To answer your question – yes Neptune will highlight all planets in water as he moves throughout Pisces over the course of the next 14 yrs or so. So it’s important to look at all of your water planets – not just your Sun. The earlier degrees will begin to feel his impact first (and you may even be feeling now) while the later degrees won’t likely feel the big impacts for a while. Both your Sun and Natal Neptune will be impacted – however the time frame will depend on the degree they are in. I have 4 major planets in Sag and 2 minor ones in Virgo. Will I get slammed? Should I start freaking out now? Cause I am! Crystal, I’m interested in the psychic energies that Neptune being in home will bring. I seem to be getting ALOT of that energy out of nowhere. I’m in-tuned with it, but the instances of these things occuring are becoming alarming. What in the world should I do with all of this psychic energy? I don’t want to be overwhelmed by it. It’s to the point that I dreamed yesterday morning that a good friend was saying to me, “Did you get my message? Do you understand the message clearly?” I woke up only to find that she’d texted messaged me an hour before. Nothing emergent, she just needed my addy to send me a Christmas card since she’s moved out of state. WIthout going into alot of detail….this kinda…think about a person and they manifest by calling, showing up, texting, as well as the opposite…dreaming about people who are thinking about me…it’s getting to be too much. I feel constantly interrupted. I’m a Pi Sun, Moon, and Merc….so I have to manage these interruptions or I become emotionally overwhelmed. I’m planning a trip with a calmer friend before Christmas. We are going to get a hotel out of town and just chill. I need it. This energy is giving me the nervous jitters and I’m starting to have back spasms alot. Is this Neptune return a part of that psychic energy surge? Hi Ms. Teeq1974! What you’re going through could certainly be Neptune’s influence – particularly because Neptune rules psychic and mystical things … including dreams. Having intense dreams like you are explaining is definately a Neptune symptom. With all your Pisces planets – particularly that Moon – you’re a sponge to outside energies and the best remedy for that is to lay low at times. So what you’re doing is really the best medicine possible. Definately take time out (particularly away from people) to rejeuvinate yourself in order to “regroup.” Then once you’ve “wrung out your sponge” so to speak you could immerse back into the world. On the positive side of things, you could use Neptune’s energy to refine your psychic energy – and use his time through Pisces to grow or enhance that side of you. Try and get a journal and write down your dreams and that may help you understand or bring more clarity to these energies. It’ll be interesting for you to note what happens when Neptune touches off all those Pisces planets. Good luck with everything and remember that Neptune is at home in Pisces so some benefits can be gained on your end through his passage through. Thanks Crystal. Have a very Merry Christmas and prosperous New Year’s!! You too Ms. Teeq1974 and enjoy that trip!! I just did that with a sensitive friend of mine. I was the calm friend that took her on a mini vacation away from the stress. It helped, but we weren’t able to get away very long. People are constantly try to get at her. And she tries to help them all. I keep telling her she needs to save some energy for herself. These people wear her out. She is Scorpio. She knows something big is coming up. I wonder if this transit has anything to do with it. You are a good friend. It’s likely that she has a lot of the water element in her chart with the way you are describing her. Neptune will definately have a positive affect on her with his passage through Pisces. Yes, I have experience the power of a Neptunian relationship! I didn’t realize it at the time, but when I look at our charts in synastry, my Neptune was conjunct his Juno and his Neptune was conjunct mine. We were each other’s “dream come true” in many ways. It ended because of “circumstances”, rather than because either of us wanted it to. I guess I do still fantasize about him at times……. Thanks for your comments Limerence. What you’re describing certainly fits the Neptunian bill! He’s certainly to blame for those fantasies. The thought “better to have loved and lost than never to have loved at all” comes to mind when I think of what he can take away. However, it can be nice to look back and remember the good times. Crystal, your description seems to fit my life to the Tee. Married for 18 years, I thought everything was perfect. My husband loves me dearly (more than I reciprocated) and I thought I could get away with anything…absolutely anything. Until something which happened in Oct 2015, which precipitated the whole situation. Now all the things I’ve done in the last years. Let me clarify. I’ve not been a new wife. I too love him dearly but now when I look back, I realize I did take his love for granted and thought things would always remain stable for me. The mistakes I’ve made were all unintentional…never realized they were hurting him so much. Now when he has totally withdrawn, and has started becoming very vocal about what had bee hurting him all these years, I am deeply repentant. He has never been this vocal all these years so I never realized….continue seeing things through rose coloured glasses. Now I’m deeply repentant and want to save this marriage at any cost. I have reason to believe that he still loves me although he is giving me an dose of “tough love”. I hope I’m right in believing that he loves me. My dob is May 02 1974, new Delhi 1345 pm. His dob is Jan 16 1973, Siliguri west Bengal India 0505 hours. Any views on when this relationship trouble will end. Also, any views on his career path. Thanks a lot in advance.